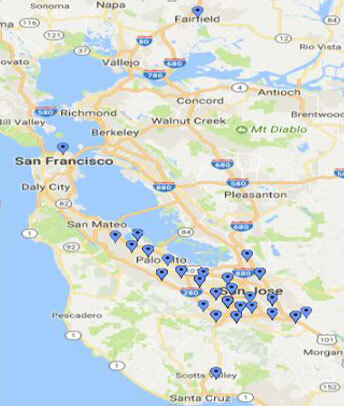 The below map shows confirmed areas of the Bay Area where dogs have tested positive for canine influenza H3N2 as of January 22, 2018. To reduce the spread of this virus, dogs with symptoms or who have been exposed to an infected dog should be isolated from other dogs for a minimum of 21 days. It is recommended that unvaccinated dogs not frequent areas where there is a known risk of potential exposure to canine influenza. To help prevent the spread of canine influenza several boarding facilities are now also requiring this vaccination. There are two forms of canine influenza: mild and severe. Thankfully, the majority of dogs will contract the mild form of canine influenza, which is often self-limiting. The most common symptom is a cough that can stick around for up to 30 days despite treatment with antibiotics and cough suppressants. Nasal discharge, ocular discharge, sneezing, lethargy and decreased appetite can also be seen. Dogs who are more severely infected will often develop pneumonia. Symptoms of pneumonia include fever, yellow or green nasal discharge, increased respiratory rate and effort, severe lethargy and anorexia. The severe form of canine influenza can be fatal, although thankfully mortality rates are low. Pneumonia is diagnosed by taking chest x-rays. What should you do if your dog is exhibiting symptoms? Schedule an appointment with us so we can evaluate your dog. Please advise us if you see signs of the flu so they can be seen in our isolation ward. How do you diagnose canine influenza? This needs to be taken within 3 days of the dog showing illness to be accurate. If this test is performed 4 days or more after symptoms have arisen, this test becomes less able to detect the virus. Canine influenza vaccinations are available for h2N8 and h2N2. The vaccine that Theater View veterinary Clinic is administering is for both strains h2N8 and h2N2. This vaccine is important for dogs that will be at boarding facilities, grooming facilities, going to dog shows, going to dog parks or traveling out of state and within the state. With any flu vaccine (just like the ones people receive), there is always a chance that it will not be 100% protective, however it provides benefit in that often the symptoms will be less severe and the window in which their symptoms are present is often shortened. The vaccine is given as two boosters given 2-4 weeks apart. While vaccine reactions are always possible with any vaccine, we have not seen any increased evidence with this vaccine. Optimal protection against canine influenza is 2 weeks after the second vaccine is administered. It is strongly recommended that dogs receive this vaccine 2 weeks prior to boarding or participating in any other social activity with other dogs. Where can I find more information about canine influenza? All dogs receive this vaccine annually if they socialize with other dogs. This would include dogs that go to dog parks, play groups, boarding, grooming or dog shows. The second vaccine of the initial vaccine series is given at least 2 weeks prior to boarding, or grooming, or participating in any other dog social activity. The cost of the vaccine is $35.00. If your dog has had an exam in the last 12 months an appointment can be made with a technician during regular business hours Monday – Friday. If your dog has not had an exam in the last 12 months, an exam will be needed ($55) at time of vaccination.